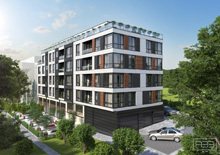 The complex comprises of twenty three apartments with sizes varying from 45 to 85 sq m. All premises are finished in accordance with the latest Bulgarian and European building standards, designed to offer maximum comfort and modern looks. The bathrooms and lavatories are fully equipped with mono-blocks and shower cubicles while the floors are done with quality granite tiles. The same type of tiling is used in all corridors and kitchens as well. Each apartment incorporates a spacious living-room with a kitchenette, a bedroom, bathroom & lavatory and a terrace. Air conditioners are mounted for every bedroom. In the process of construction we have aimed to achieve maximum quality using only the best materials. The facades and the exterior walls are insulated by 50 mm thick hydro- and thermo- insulation plates, covered by mineral Kaparol coating. All apartments are equipped with double glazed PVC windows, which guarantee excellent protection against outside noise and temperature interchange. The electrical circuit of the whole building is completely finished with mounted switches, sockets, fuse boxes with MG fenders; internet, TV and telephone sockets. Entrance and interior doors are made of MDF in light oak colours. Benefiting from the magnificent location, Bujaka Beach Complex offers a splendid view towards the sea for all apartments on the third and fourth floors. It has a private parking provided to secure utmost convenience of the owners. The complex is easily accessible by an asphalt road and regular connections of the local bus lines. A beautiful marina is at hand only a couple of kilometers up the coast, while Burgas International Airport lies some 30 km (18.6 miles) away.